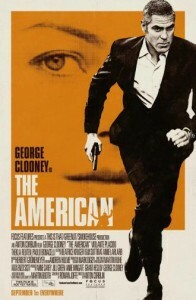 George Clooney stars as an assassin on his last assignment in The American, now scheduled to release on Blu-ray Disc Dec. 28, 2010. Bonus features on the Blu-ray and DVD releases include deleted scenes, “Journey to Redemption: The Making of The American,” and feature commentary with director Anton Corbijn. The Blu-ray Disc is a BD-50 with 1080p video at 2.35: 1 aspect ratio and sound formatted in DTS-HD Master Audio 5.1. Exclusive extras include BD-Live, pocket BLU (with Advanced Remote Control, Video Timeline, and Mobile-To-Go), My Scenes, and uHear (which skips back a few seconds and turns on subtitles for hard to hear audio). Total run time is 1 hour 45 minutes. The American stars George Clooney, Violante Placido, Thekla Reuten, Paolo Bonacelli. The film was released to theaters in the U.S. on Sept. 1, 2010.